Hats off to the Curtain Up Theatre Company. They received a well-deserved standing ovation at the end of their Saturday Night At The Movies show at Ffwrnes, Llanelli. The evening featured some of the best loved songs from music and television, under the musical direction of Anne-Marie Marks and with choreography from Debbie Garratt. The inimitable Denys Jenkins BEM (Denny Twp to Llanelli's Panto fans) was the host with the most, with a rich repertoire of 'true stories' for his Ffwrnes fan club. 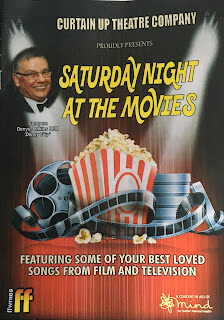 From the opening with the Drifters classic Saturday Night At The Movies, this was an evening where the cast enjoyed just as much as the audience. And it was all in a good cause, with the proceeds from the night going to the Llanelli branch of Mind. The team at Jenkins Bakery will be doing their bit to support the Nation Radio Pride of Wales awards this week. The prestigious awards dinner takes place at The Vale Resort, near Cardiff, on Thursday night. The awards recognise and reward the unsung heroes in Wales. Operations director Russell Jenkins said: “We will be doing our bit to make sure the event goes well by supplying more than 200 cup cakes for the awards dinner.